Aussie Mum and family swap the delights of Bris Vegas for the City of Sails. You can take the Brissie girl out of New Zealand, but you can't take NZ out of the girl. Or something like that. What I mean is that although I'm no longer an Aussie in Auckland, there's a little Kiwi - or perhaps a Kakapo - that resides inside my heart. So when @LanghamAuckland shared some exciting news via twitter, I just couldn't resist posting about it. Remember Earth Hour? It's coming up this Saturday, and to celebrate the hotel's Chuan Spa will be plunged into darkness, and the lights replaced with hundreds of soy candles. Then, the spa will offer a unique Fire and Ice Candlelit massage, using hot stones and ice-cold gemstones. Best of all, 10 per cent of the proceeds from each massage will go to New Zealand's WWF. To mark Earth Hour 2010, the hotel's chandeliers and main lights - including the iconic rooftop sign - will also be switched off, and replaced with 1700 soy candles. So you can pamper yourself AND help the environment as well. You can't beat Kiwi know-how! All good things come to an end, and so too, has our stay in New Zealand. Husband has accepted an offer too good to refuse, so we will be relocating across the ditch to Australia, back where it all started. It's with mixed feelings that we say e noho rā' to Aeotearoa, and for now, I will still be blogging about our adventures there whenever I get time or inspiration. 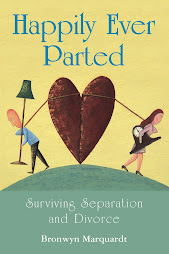 In the meantime, thanks for reading, and for your wonderful comments - I love them all. We enjoyed an Aussie Bush Christmas, with loads of family and friends, just as it should be. My siblings, parents and I were together for the first time in years, plus we had loads of extended family and friends around as well. My sister and hubby were our gracious hosts, and as usual, they went all out to ensure everyone were comfortable, fed and watered. (Or alcohol-ed. Though I think I may have just made that word up). The kids spent most of the time in the pool, playing with their cousins, and eating and drinking far too little. While the adults spent most of the time OUT of the pool, and eating and drinking far too much. Just as well Christmas comes but once a year! Christmas Eve was spent, in the main street of Wondai, for the 60th annual Christmas Street Carnival. Each year, we say never again; Each year, we go again anyway. There are the ham and turkey wheels, the merry-go-round and jumping castle, plus free ice-blocks for the kids from Santa. Not to mention the drinks at the RSL a bit later. Hey, it's tradition! On Christmas morning, it's church, again in Wondai. This year, Uncle O. was the layreader, and we giggled as one of his grandchildren yelled out: 'Hello Pop!' Then it was back to L and O's for champagne, pina coladas, and beer ... and mountains of food. L's special muscat-glazed baked ham, barbecued chickens, prawns, bugs, crabs and loads of salads. Then unmentionable desserts. All washed down with good Aussie wine and beer, plus softies for the kids and the drivers. The next morning, we enjoyed a barbie breakfast on the deck at my parents' home, before taking the long drive back to Brisbane, and discovering that Santa had visited Nana too! Much to my surprise, I discovered the kids had been Very Good all year after all. Ah ... it's the magic of Christmas. (Pic: Santa and a Very Special Reindeer, photo courtesy of Husband). I admit it: I've been slack. I know I haven't blogged lately, and I have a couple of cameras worth of shots to upload. But I have two words for you: Blame Santa. Yes, the time for end of year/Christmas craziness has well and truly fallen upon the Aussies in Auckland, and I've not had a moment to blog. Or shop. Or do much of anything apart from work and kid-wrangling. Oh, and shouting. And forget about Christmas shopping. (I'm thinking Santa is going to need more than a few little helpers this year...)! Anyway, I will post about all the fab things we've been enjoying in and around Auckland, as soon as I get time. But in the meantime, I would love to wish you and yours all the best for the festive season. This year, we're heading home to Australia to spend our Christmas with family. I loved Christmas in Auckland last year. The flaming pohutakawa trees, the Franklin Road lights, the near-empty and not-boiling-hot beaches, and the fact that Auckland empties out over the holidays. But we did miss our family and friends, so it will be nice to share the festivities with them this year. Merry Christmas to all my dear readers and followers and thanks for your comments and emails during the year. I hope Santa is kind to you and that you're not feeling quite as stressed as I am! Eek ... send a ransom! Santa has been kidnapped by terrorists! 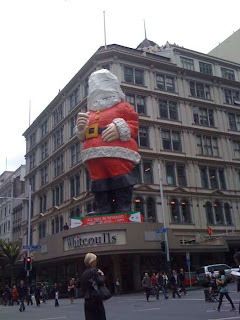 No, actually this photograph, courtesy of NZ tweep @gnat, is of Auckland's famous Whitcoulls Santa about to be unveiled in the CBD. Since the 1960s the iconic Santa has looked down benignly on Aucklanders as they dodge homeless people, bodily fluids, and fight each other for Christmas bargains in the lead-up to Christmas. Last year, there was a huge controversy, because some Bah Humbug/politically correct types thought Santa looked seedy, with a finger beckoning creepily to children, and a rusty eye winking sleazily at them. Seriously, even the P. word was used. In fact, there was a debate as to whether old Santa should be retired, but public opinion weighed in heavily, and it was decided Santa should undergo what all Good Santas Of A Certain Age Do, and have a makeover. (In fact, there's even a Fan Page on Facebook now for NZ's infamous Creepy Santa). Anyway, this year he is back, younger and better than ever before ... but not before the children of Auckland were forever traumatised by the sight of their beloved Santa trussed up and his face covered in bandages! Even better, the usual Kiwi Ingenuity has shone through, with one of the people who have done some of the cosmetic work now auctioning up Santa's rusty eye on trademe. Check it out - www.trademe.co.nz under antiques and collectables, then click on Maori and New Zealand. At the time of blogging it was going for $NZ102. Wonder who will be getting a lump of coal in their stocking this year? We flew to Samoa with Air New Zealand, which was awesome. Well, except for the food. But you get that, right? Miss 6 enjoys the inflight entertainment. Duty free shopping, Samoan style. So, while in Samoa, we chose to do an all-inclusive meal deal. In my single, child-free travelling days, I would have choked at the thought; preferring to eat locally (and probably vicariously). But when you have kids, you need good, reliable food, and often. The all-inclusive deal for Aggie Grey's Lagoon Beach Resort and Spa at Apia was amazing. I think Kyle and I paid a bit over $100 each extra for it, and the kids were free. That was for the duration of our stay. C. was such a favourite with the breakfast chef, that he was invited up to help cook. Check out the cap! Another omelette, you say? Certainly! He loved the food. Tucking into mac and cheese for lunch. And before. Truly, the most divine-tasting food. Especially the palusami - coconut milk and taro leaves. A prawn curry from the Asian restaurant. There was a choice of 3 or 4 restaurants for dinner. This was one of our faves. Vote for me at webbieworld by clicking on the logo!